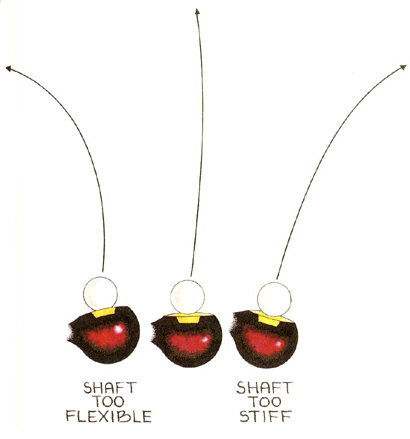 The most important consideration in purchasing golf clubs is also one of the most neglected - the shaft. I am a strong advocate of getting the stiffest shaft you can handle. A stiff shaft does not whip through and close the clubface as easily as a more flexible shaft does, so you can actually swing a bit more aggressively. Too often, it is assumed that, when a few shots with a new club stray to the right, the shaft is too thick a grip or an incorrect lie. So be sure the other elements of your club are properly fitted. Then, if you consistently fail to square the club at impact, you'll know that you do indeed have too stiff a shaft. The only exceptions to this rule are women and weaker senior golfers in desperate need of more yardage. With a more flexible shaft, these golfers will have an easier time releasing the club at impact, and they might even develop a draw which will add a few yards of roll and distance.